In many countries, a special day is set aside to celebrate the national flag. Peru is no exception. 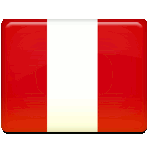 National Flag Day in Peru is observed on June 7. It commemorates the Battle of Arica and the heroic act of Alfonso Ugarte. The Battle of Arica was fought on June 7, 1880 between the forces of Peru and Chile. It was one of the most important battles in the War of the Pacific. During the battle, Chilean troops attempted to capture the Peruvian flag. To prevent this, Colonel Alfonso Ugarte, who was carrying the flag, rode his horse over the cliff and fell into the Pacific Ocean. Peru lost this battle, but its anniversary is celebrated as Flag Day in order to commemorate Ugarte's sacrifice. The current national flag of Peru is different from the flag saved by Ugarte, it was adopted in 1825. It is a vertical triband with a single white band in the middle and two red outer bands. White stands for peace and bravery, while red represents the blood that was shed during the struggle for independence. Variant flag has a coat of arms in the center. Flag Day in Peru is not a public holiday, it is a regular working day. It is marked with flag hoisting ceremonies. During the flag raising, the military march Marcha de Banderas is sung.